I'm using this opportunity to reach out to all of my readers. 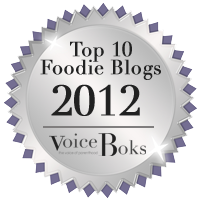 My other blog Not Your Ordinary Recipes has been nominated for Top Foodie Blog 2012 at www.voiceboks.com. My dear friend, Val, at Mental Chew has also been nominated. Will you please click on the badge and vote for us (Not Your Ordinary Recipes and Mental Chew)? Yes, you can vote for both of us!! Leave us a comment to let us know you voted for us! We'll make you a pizza made out of gold when we win... even if you win the lottery. I voted for both blogs. Good luck!